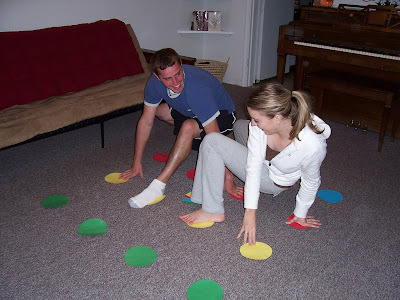 Love, Actually: A Twist on Twister! you've got a perfectly silly, but potentially romantic date! *We found it impossible to use a spinner (like in the original game). So, we just took turns calling out the color and right foot, left foot, right hand, left hand. It had to be a quick call-out (to make it less likely that we could cheat)...and that worked perfectly. *You can even throw in another position---Kiss! Try landing a smooch on each other's lips -- that oughtta get your body twisting! 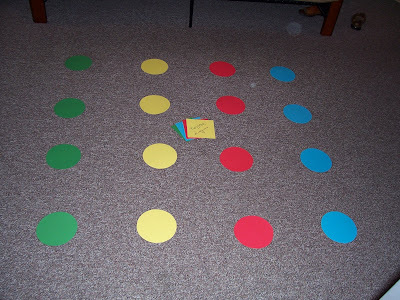 Leave me comment with any other fun ways to spice things up with Twister! One way to replace the spinner would be to record on a computer each possible limb/color variation, save each one as an individual audio file with a few seconds extra time before and after the directive, and then play the sound files on the random setting on computer or MP3 player hooked up to speakers. It would also make it more hectic since there is a time limit between moves. If you Google "Automatic Twister Spinner" you will find a few programs that can do it. There is also an iphone app called Twister helper.